The Blackmagic Design Intensity Shuttle with Thunderbolt performs four fundamental functions - exporting video from a camera, transferring it to a computer or workstation, adjusting resolution accordingly as part of the process and, at the same time, connecting to an HDMI monitor and implement colour correction at the optimum resolution. Video is captured uncompressed, releasing it from the algorithms that pack and compress it tight onto a memory card. It’s then moved to a computer without decreasing quality – it’s worth noting that many shuttles don’t have the capacity for uncompressed transfer and aren’t capable of substituting effectively, often to the detriment of the footage. The transfer from the camera to the Shuttle is done via an HDMI cable, the following connection from the Shuttle to the computer can also be HDMI. However the Blackmagic Design Intensity Shuttle has a Thunderbolt port, utilising advanced data-transfer technology that, with a 10Gbps capacity, is extremely fast. The Thunderbolt is also bidirectional, enabling it to serve both as an input and an output. Data does not stay in the Blackmagic Design Intensity Shuttle with Thunderbolt, it only serves as a transit. As the information travels through, though, resolution can be adjusted to arrive at the destination computer in a different format. SD can become HD and vice-versa, so footage from different cameras shot in different resolutions can be matched up to look the same. The Shuttle is a capture-and-playback device, more commonly known as an I/O device for its inputs and outputs. 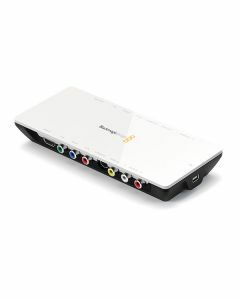 Other than the HDMI and Thunderbolt connections previously mentioned, the Shuttle also has analogue video ins and outs, as well as HDMI and RCA audio ins and outs.